Upload the folder in this archive to your Symphony 'extensions' folder and rename it to color_chooser_field. Enable it by selecting the "Field: Color Chooser", choose Enable from the with-selected menu, then click Apply. You can now add a "Color Chooser" field to your sections. 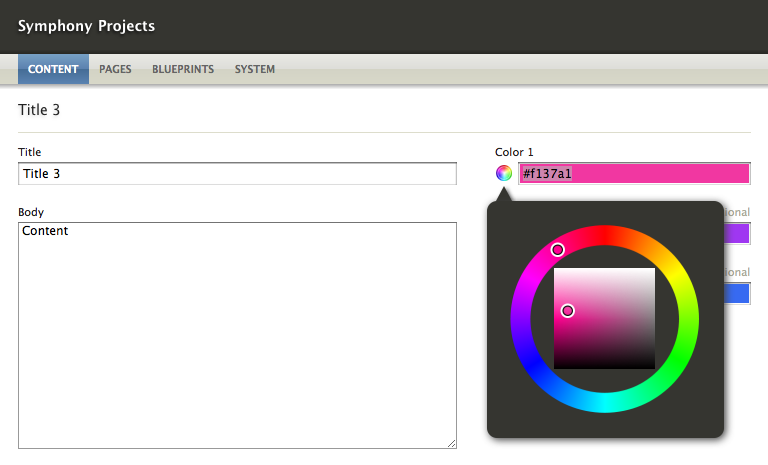 On the entry edit screen, it uses the Farbtastic Color Picker http://acko.net/dev/farbtastic to visually select a color and place its hex value into the field. Update for Symphony 2.3.3. Since the jQuery update, needs shim for jQuery Tooltip.